Take your dog for a long walk before the festivities start. This will allow him to potty outside before all of the noise begins and the exercise may help tire him out. During firework displays, keep your dog indoors in a confined and secure area with shades closed. You might also try adding some white noise with an oscillating fan. Turn on your television or radio for an added distraction. 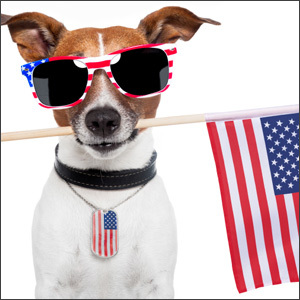 If your dog does become stressed, try to make the fireworks a cue for fun time to begin. Play a fun game with him or give him a food puzzle or stuffed Kong to play with. It’s not recommended that you take your dog to a fireworks display. However, if you do, keep him on a leash and check his collar to make sure that it’s properly fit so he won’t slip out of it. Make sure your dog’s collar has current identification tags on it, in case he does escape. For extra safety, make sure your pet is microchipped. July 5th is one of the busiest days of the year for local animal shelters. Dogs end up miles from home, confused, disorientated and exhausted. Having an ID tag and microchip can help expedite your reunion. If your dog is extremely sensitive, consider consulting your veterinarian for a mild sedative or tranquillizer to help keep your dog calm. There are also herbal remedies that are available which can sometimes help. Speak with your veterinarian about your options. By using these recommendations you can help make the holiday enjoyable for everyone. If you need help or advice with dog behavior problems such as pulling on the leash, jumping on people, aggression or fearfulness, please give us a call. We offer free evaluations (at your home or our facility) and affordable and effective solutions to all of your dog training needs.